Ha Long Bay is said to be the 8th Natural Wonder of the World. I believe it’s one of the many 8th natural wonders of the world that exist in a great number of places where the Tourist board have a say. I’m pretty sure Plitvice Lakes in Croatia fulfilled the role of 8th natural wonder the world, as well as Gulfoss in Iceland. Maybe these guys should get together. Back to The Bay. It was Thursday, I’d arrived at the hostel around 9pm, having lost an entire night. Adrenalin must still be running, because I was awake at 7.30 the next morning to sneak myself onto the 8.00 tour of Ha Long Bay. It involved a bus trip across to Ha Long City, a boat ride around the bay, a couple hours kayakking, back to the boat, eating, drinking and sleeping on the boat, before another trip around the bay and back to Hanoi. Wait, kayakking? It might help to know that I don’t swim. My attempts at treading water have largely involved not treading water, and sinking in a mild but not unreasonable panic. So it might be safe to assume that kayakking isn’t my sport / hobby of choice. Then again, holidays are all about trying new things, aren’t they? And I was only dead for 6 minutes. My parents read this, I shouldn’t joke. 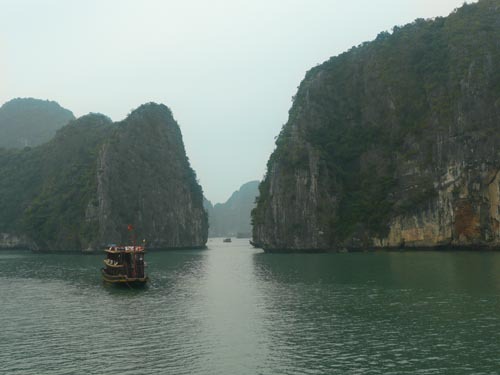 The number of islands in Ha Long Bay varies widely depending on your sources. But it’s an impressive amount limestone islands scattered around 1553 sq. km. 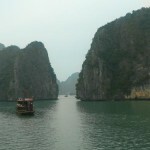 of Ha Long Bay, and even more extending up the coast to China. Rough guides say 1969 of them in the bay, and another two thousand along the route. The result in the misty/cloudy weather was a seemingly endless scattering of rocks appearing and disappearing as the boat progressed deeper and deeper into the unknown seas. The name itself means “Dragon Descending”, so called for the legend given to the area. It tells of a celestial dragon sent by the Jade Emperor to stop an invasion. This dragon spat out pearls which formed islands with jagged rocks to destroy the incoming fleet. They say the dragons enjoyed themselves so much, they moved into the area themselves, and now live among the islands. No matter how much we drank. I suspect some of the others did. The kayaking was also really good fun. Being two-man kayaks, I teamed up with the Swedish guy I met on the bus and we created a formidable team, after half an hour out on the waters, drifting, sending ourselves into tunnels and around the islands we even worked out that we could steer our kayak and weren’t just the victims of fate of chance. We’d lost the guide, most of the rest of the group, and our larger boat of course. We made it back alive though, of course. We had quite a large group of 27 people, and were served up some fantastic Vienamese food on the boat. Beer and music was also in plentiful supply, as were the bottles of vodka, although perhaps fortunately, the drink wasn’t included in the cost of the tour. I will note that it did feel very much like being on the set of Big Brother when the camp-sounding Yorkshire guy found his way over from a boat 2 decks down. Like the new housemate, he continued to shout very loudly about the injustice of having missed the Backpacker boat, and ending up with a bunch of old people who had already gone to sleep. “What does India stand for! ?” he proclaimed randomly. “I’ll Never Do It Again”, for no reason – before he started listing all the places in India he really enjoyed visiting. Genius. On the way back into Ha Long City, we picked up some more people who had been staying on one of the islands in the area and dropped a few off, greatly increasing our size, and weight on the boat. “Is this boat leaning a bit?” We all wondered aloud. “They are asking if you could all move to this side of the boat”, said Dao The Tour Guide, “it is because we are sinking”. Well, it’s about time to go and find a computer online so I can actually post these past two entries, then it’s off into the Hanoi Old Quarter for a bit of exploration and food.